"Breakfast is the most important meal of the day". In my opinion it provides you with energy throughout the day, keeps you sharp and with the right food it promotes fat loss. Nowadays it difficult to get a good breakfast at the office; its either too oily or too fatty. There is simply no balance between protein and carbs, not to mention the cholesterol levels. Few years back (when I'm in shape :P), I used to bring breakfast and sometimes lunch to office. That was when 7.30 is still ok to start the journey to office. Now its no later than 7.05 or my punch card will be red. To compensate for the time; sometimes I would prepare cut fruits the night before but mostly I would customise my breakfast at the cafeteria. Fed up of having unhealthy breakfast at the cafeteria, recently I've decided to stock some food at my workstation. Nestum, Digestive biscuits, Milo, Toastlimo bread, peanut butter and etc. 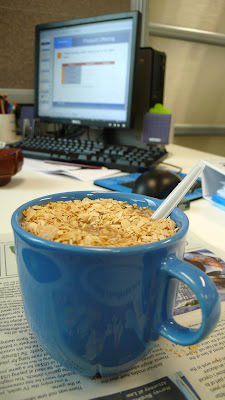 Here's my current favorite breakfast: Milo 3 in 1 + a hefty portion of Nestum! 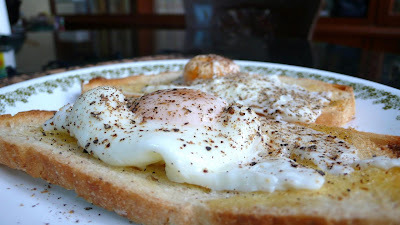 However on weekends, when I'm at home; my all time favorite, my comfort food is poach egg on lightly buttered fresh toast + salt and coarse fresh ground peppers.. nyum!!! last time u cooked for us was really yummmmeeehhh... sheedaaapp..
moreover.. time tuh cam welcoming alya .... ahahha... good old days kan? "the best camera are your eyes.. and the best storage are your memories.. it only ends when your out :)"
lagi 3 hari breakfast roti + kacang pool! sungguh berkhasiat. kalo ko selisih ngan aku tengah jem kat LDP, ko bleh tgk aku tgh kokak epal.